Phi Phi Lee, south-west of Phi Phi Don, looks like a pebble stung by high rock cliffs, cold, gloomy and inhospitable. Yet here lies one of the most popular bays of Thailand, Maya Bay, a paradise beach in the turquoise waters surrounded by high boulders that make it almost invisible from the sea. Here's a tip if you do not want to share the beach with hundreds of tourists : Don't go there after 9AM! Or even better, spend the night camping on Maya Bay. 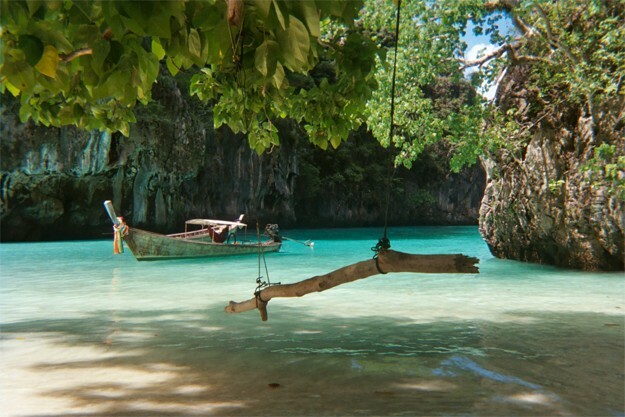 Many others coves and beaches are hidden on Phi Phi Lee. Ask your long tail driver to take you to Loh Samah Bay, a small beach less crowded than Maya Bay. Do not miss Viking Cave. On bamboo scaffolding, courageous Thai collect birds' nests, of which the Chinese are so fond.